Université Laval won the SAE Supermileage competition for the third straight year. 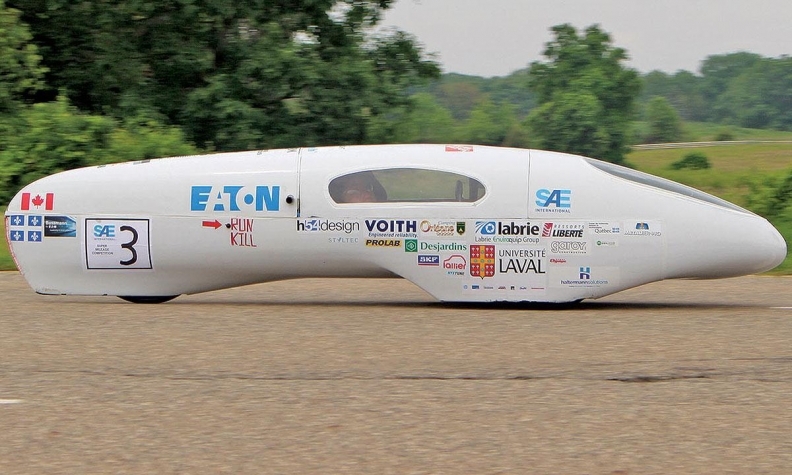 Engineering students from Québec's Université Laval have set a new record for minimal fuel consumption in this year's Society of Automotive Engineers (SAE) Supermileage competition. The Québec students achieved 0.0620947 kilometres per litre (3,788 US miles per gallon) to win the competition for the third consecutive year at industrial products manufacturer Eaton's proving grounds in Marshall, Michigan. The mileage topped that of the No. 2 team, from Penn State University, by 0.273505 L/100 km (860 mpg). No other team topped 2,000 mpg (0.117607 L/100km). Julien St. Hilaire, a member of the winning team, praised the 2.5-km (1.6-mile) course: "It's really smooth and allows us to get the most out of our vehicles." Each team used a modified 56cc Briggs & Stratton Junior 206 racing engine and gasoline provided by Eaton but designs and builds its own vehicle. Laval's carbon-fiber-bodied car weighed just 96.1 kilograms and rode on two front wheels and one rear wheel. The competition, in its 37th year, drew 21 teams. Seventeen completed the technical inspection: 10 from the U.S., five from Canada, and one each from India and Lebanon. Twelve had successful fuel economy attempts. This year's entries included two all-female teams, from Indira Gandhi Delhi Technical University for Women and Texas A&M University.